Saving just a little bit every week can make a huge difference! Take the 52-Week Savings Challenge in 2016 and see your small savings add up to over $1,300 in a year. The way the challenge works is simple. The first week of the year, transfer $1 to a sub-savings account or 1-Year Add-On Certificate. The second week of the year, transfer $2. Every week, increase the amount you transfer into your sub-saver or Certificate by $1. The first half of the challenge is relatively easy. In fact, I bet if you look in your pockets or purse for some spare change, you can come up with a single dollar for week 1. This is all about building your savings while starting small. Once you get to week 5, the commitment is a bit bigger than spare change. Where can you get that $5? Maybe you buy coffee every day. For just one day that week, you can drink coffee at home and there’s the $5 you need for the challenge. By changing your saving habits, you can slowly change other habits, too! I buy lunch at work a lot. So, for week 10, I might commit to meeting my savings challenge goal by bringing leftovers for lunch 1 day that week. That’s $10 saved. 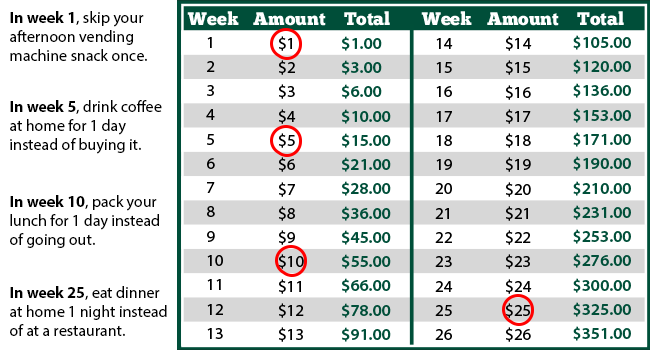 If I also bring my lunch 1 day a week in week 11, I only have to find another $1 to meet my savings goal. Building this habit helps me reach another goal (eating healthier). That’s a win-win for my savings and my health! The second half of the challenge is definitely trickier, but you’ll have built up momentum. It’s always easier for me to stay on track when I’m saving for something specific. Start thinking about what your savings is going to do for you on week 52. Are you saving to take a trip?  Planning on buying a house? Saving in case of emergences? You can do it! Remember: if something happens and you can’t save one week, it’s okay. Everyone’s situation is different. One of the hardest things about the challenge is saving at the end of the year. 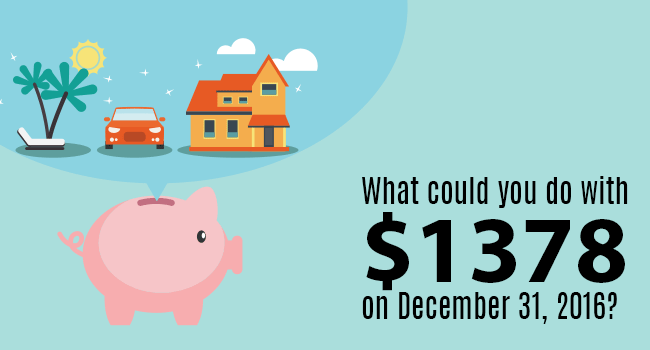 With the holidays and the new year approaching, it can be hard to save $202 in December. There are a few challenge variations that might work better for you. Go backwards: Start by saving $52 the first week of the year, and go down by $1 every week! The last week of the year, you’ll only have to save $1. 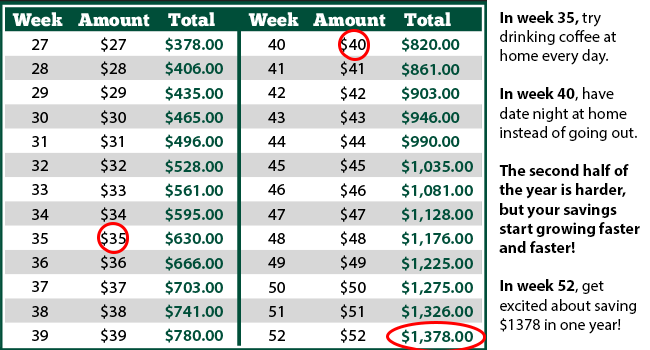 Save the same amount every week: If you want to still have $1378 at the end of the year, you can save $26.50 every week. Or, $115 a month. You could even choose a different amount to save! What about saving $1 every day for $365 at the end of the year? No matter how you do the challenge, you’ll still be building the habit of saving. I’m personally going to be doing the challenge backwards. I’ll keep you updated throughout the year on how it’s going. Leave a comment with how you’re going to do the challenge!